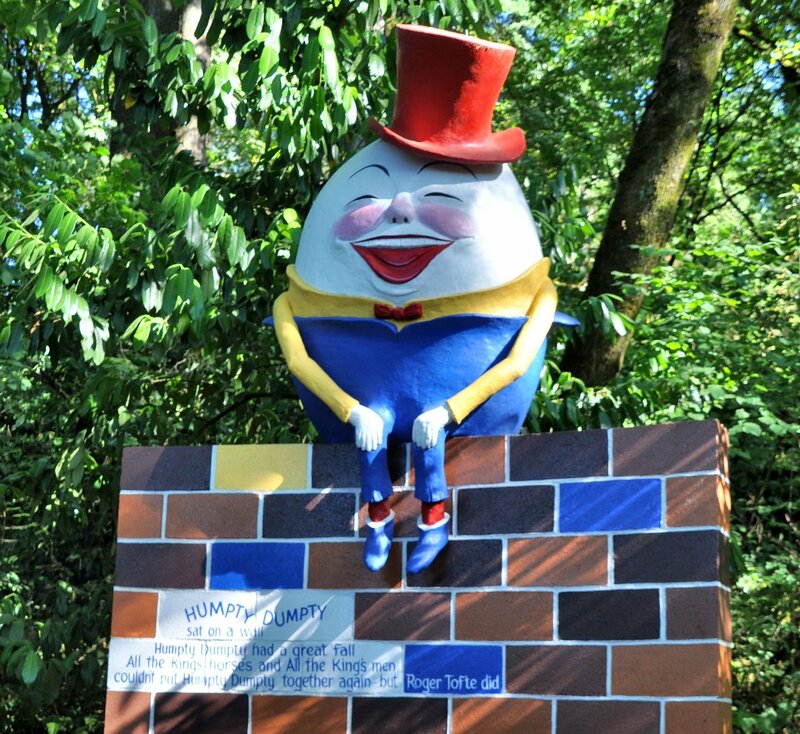 A happy Humpty Dumpty was put back together by Roger Tofte, according to the sign. 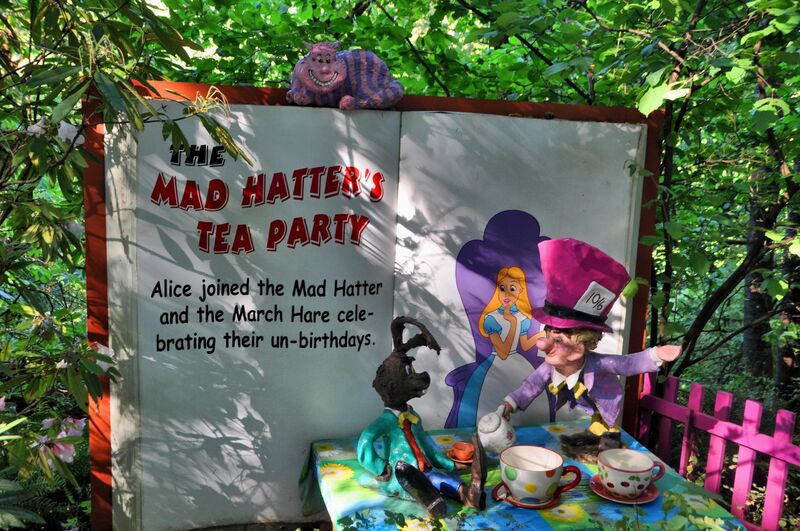 This is no hollow claim, since some unruly guests knocked Humpty to the ground last year, and Mr. Tofte was forced to prove that he could indeed put the egg back together. 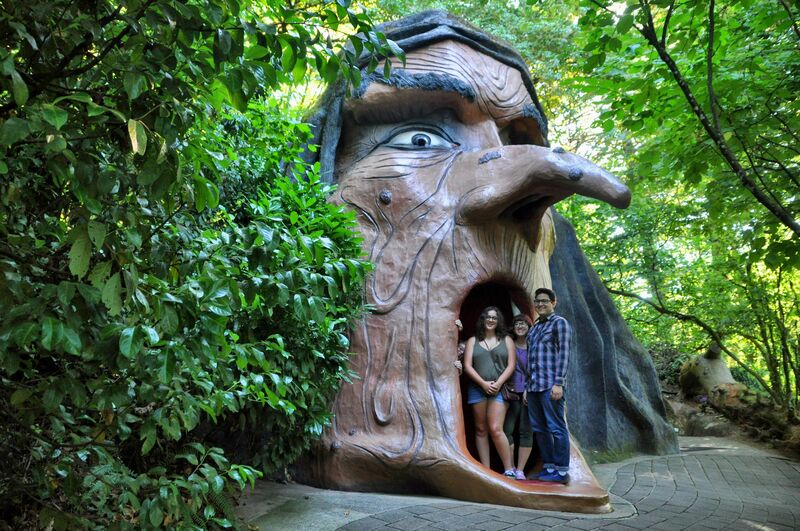 For Tara’s 18th birthday celebration, a trip to the Enchanted Forest was requested. We went last year and loved it, so I was on board to visit again! This enchanted theme park has moved through too-uncool-for-middle school, and has become a hip place to go, if you are a teenager. It is clearly designed for small children, with some great additions since the 1970s that will entertain the parents, but what keeps this place well worth a visit is that it slightly misses the mark, and crosses the Uncanny Valley. What I mean is, it’s just on the other side of cute, and has turned creepy in a most delicious way. Tara and birthday friends inside the mouth of the witch. The trail continues into the throat, with scenes from Snow White and her evil witch stepmother. 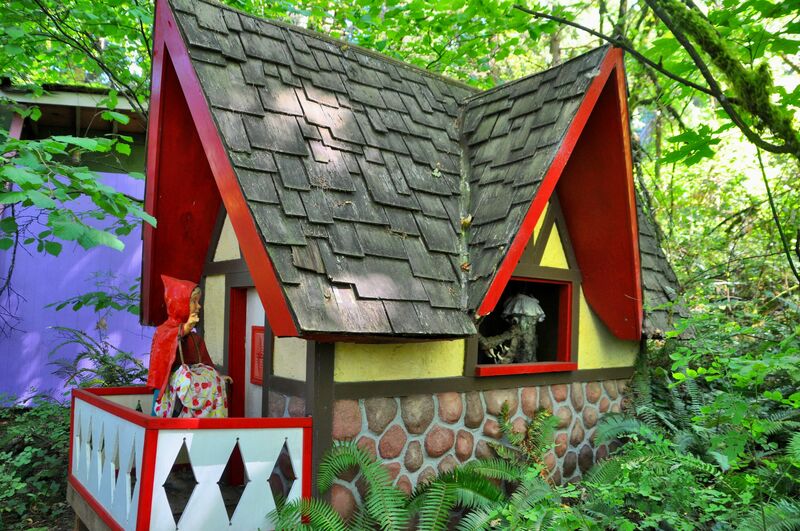 The kids peek into the windows of the tiny house of the Seven Dwarfs. 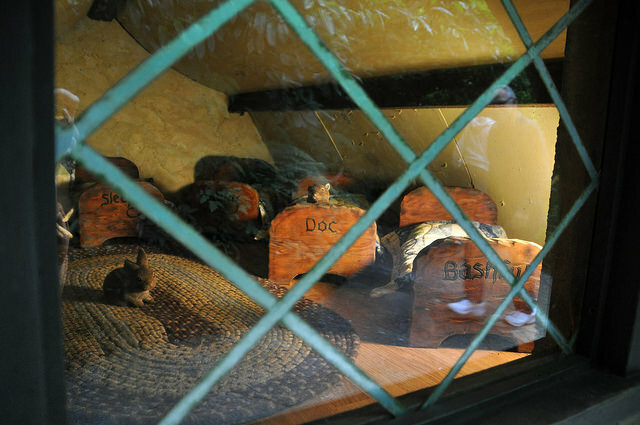 The second floor of the little house holds these darling beds, a tiny rabbit, and a squirrel doing some housekeeping. It is so much like the idea of Disneyland that I am amazed no one has sued. 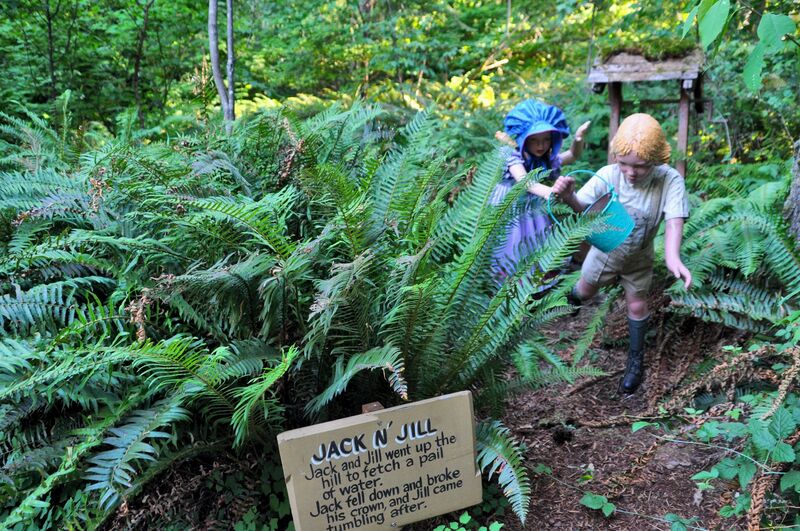 Thank goodness, because the Enchanted Forest, south of Salem, Oregon, is a high-quality theme park that’s a blast for the little ones, and genuinely amusing for everyone else. All that – for an entrance fee of $10.99, and tickets for the rides at $1 per ticket. 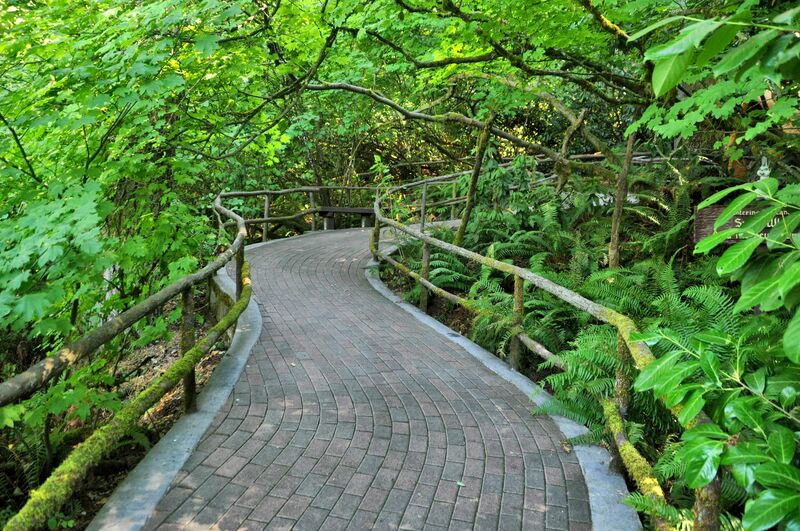 The park is a true family effort, envisioned by Roger Tofte, supported by his wife and children, and opened in 1971. A son grew up and learned animatronics, and built for us the awkward, jerking, breathed into life-sized beings across the park. One daughter wrote and directs the comedic plays that show at the theatre, and she also wrote all the music heard in the park, which is always played on pipes. 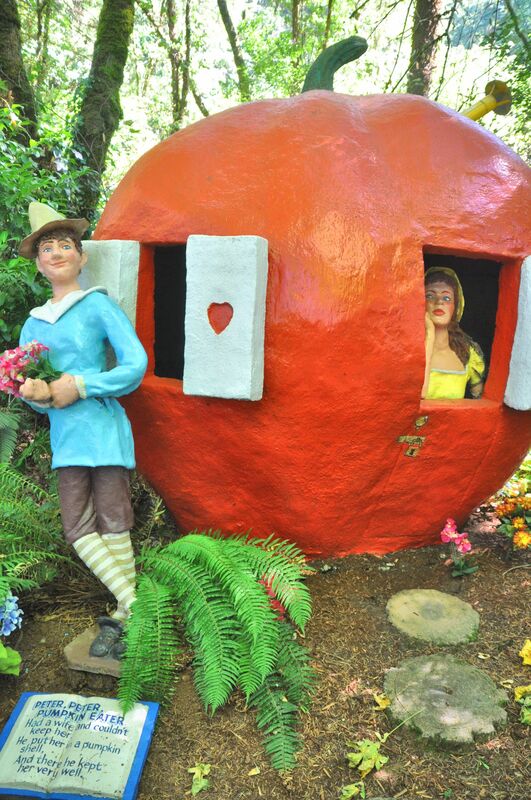 Hansel and Gretel couldn’t resist this place. Neither could Tara. 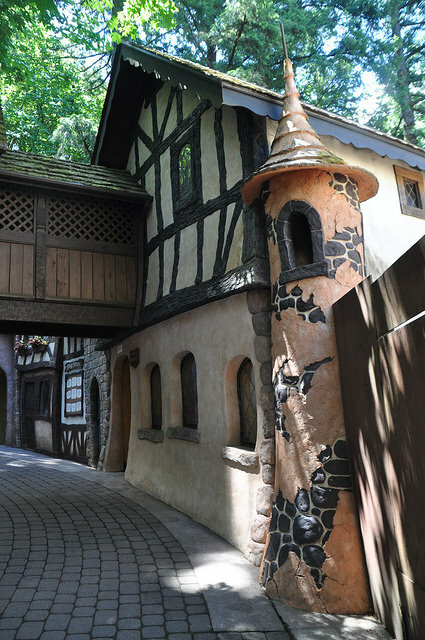 This is by far the most frightening thing in the park: animated witch beckons Gretel into the furnace, and creaking, hesitant, animatronic Gretel slowly turns her head back and forth in a “no.” Life-sized Hansel crouches in an iron cage at her feet. 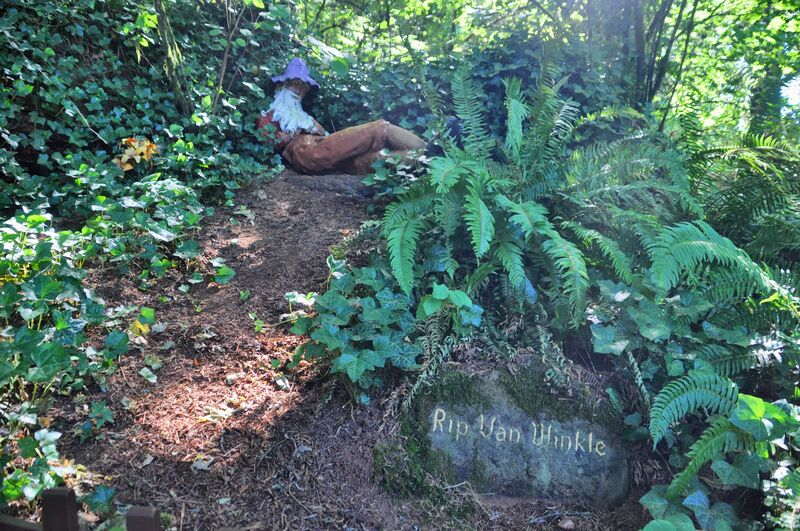 It begins just past the entrance, where guests walk along Storybook Trail through a real forest, and find miniature and life-sized creations from children’s faery tales and Mother Goose rhymes. You can stand on the trail and look, but if you get close and go inside or peek in windows, that is when the real treat begins. Or the real heebie jeebies, as the case may be. 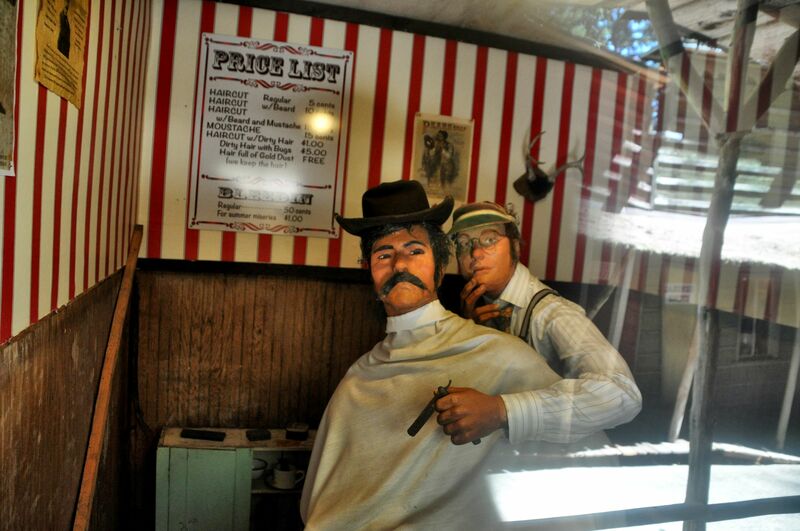 There is a Western-themed town, which is hilarious, filled with more animatronics, and named Tofteville. The kids got a big charge out of the drunken walk, where you enter a building, and follow the path out on a floor balanced on springs. There is no way to keep steady. I think I may just love Pinocchio Town the best, a European-style village that has several animated faces that peer from shutters two stories above you that swing open. The characters gossip loud enough to hear, about different storybook characters. 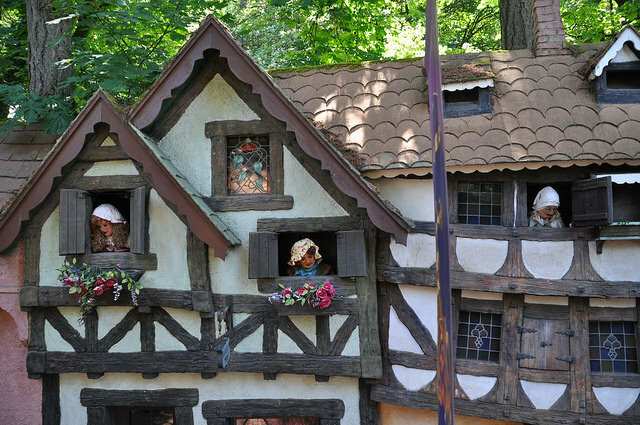 You can enter a doorway and follow a path through multiple buildings, peeking into holes in walls, and holes in cheese, and reading about puppetry around the world, and controlling a miniature train on a track through snowy Alps. Through one curtained window is a kaleidescope, that simply turns as long as you stand there. One window reveals a fabulous 10-foot-high Rube Goldberg mechanism that runs balls through a wire obstacle course. And who can stand resist the singing blackbirds baked in a pie? 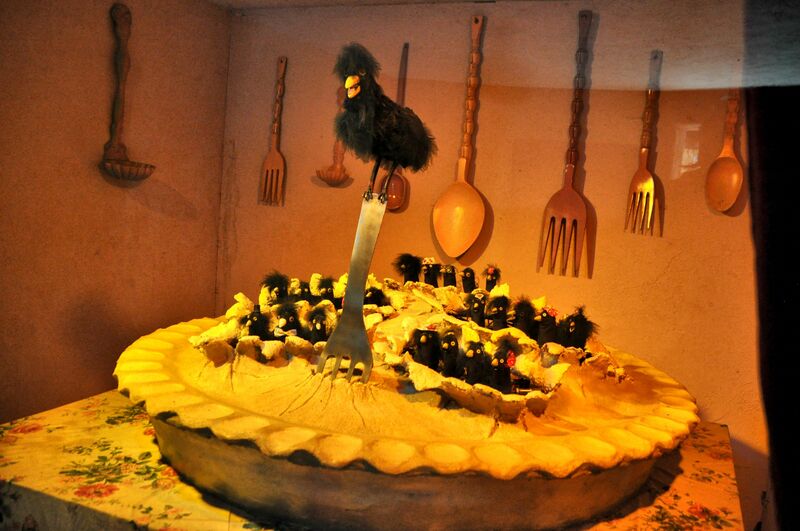 Four and twenty blackbirds, baked in a pie. When the pie was opened, the birds began to sing. 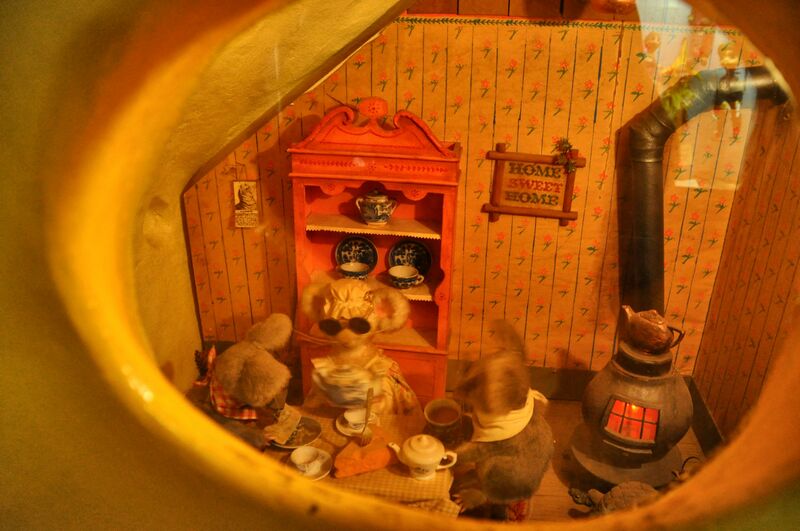 Peek through one of the holes in an enormous piece of Swiss cheese, and you can see the home of the Three Blind Mice. Where will this lead us next? 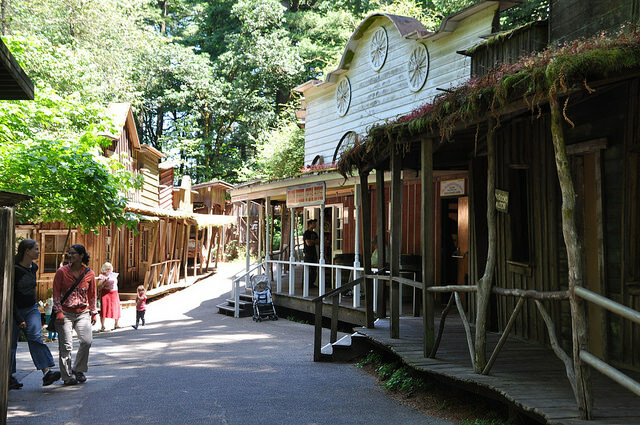 These inviting structures hold picnic tables, where people can eat the food they brought in, or buy from the vendors. The wolf listens eagerly to Red Riding Hood’s knock. 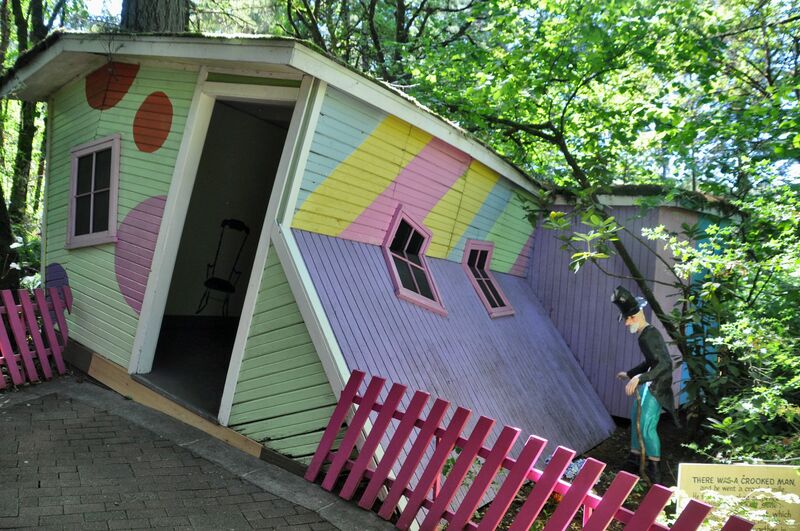 The Crooked Man invites visitors to walk through his crooked house. Mrs. Pumpkin Eater is trapped. I haven’t shown any photos of the rides, but I think I’ll save those for another day. There were too many fun photos in this post to bog it down further. In 1960s, Roger Tofte seemed to be the only person who could see the final version in his mind’s eye. He was the target of many jokes and whispers that he had some screws loose. Mr. Tofte can laugh at them all today, though I imagine he’s too sweet to do so. Both times we have visited the park, we have spotted him moving around, quietly under the radar, passing through doors that say “staff only” and happily waiting for toddlers to pass before he drives through on his scooter. The Western town, named Tofteville. In Tofteville, a barber and his client appear startled to see me. A dentist in Tofteville, getting some unruly teeth in order. My grandchildren would so like this place! If they don’t require polish or touristy appeal to be entertained, I imagine they would. 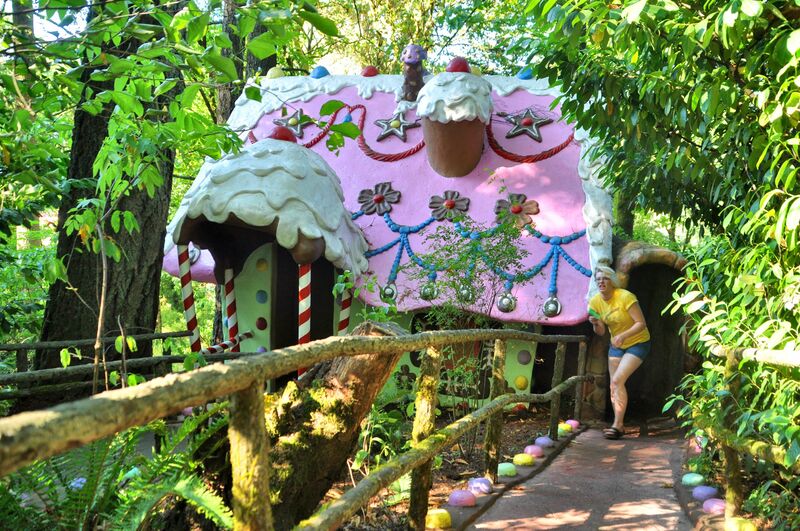 I remember visiting this park when I was a child, and being so excited about walking inside a make-believe land. I honestly think I enjoy it even more as an adult. But that reveals a dark side to my personality…. Oh my!!!!! I want to go there!!!!!!!! Ok, on that day you visit, Marlene and I have dibs on your time, ha ha! I’m glad you noticed how cleverly this park was put together. It isn’t glossy or expected, and is obviously the work of a man who is truly creative and wants to make things fun. Also, his sense of humor is everywhere. I like it more because it is not saccharine sweet. This looks so fun. I want to take Soren here when he is older. yes! Because you guys would all love it. It’s a little twisted, like you. Hee hee. Well now that you have a plan for Soren when he’s older, I’ll keep a look out for your future visit and Tara and I will tag along. We’re eager for an excuse to go back. It is a darling place and so inexpensive. It is exquisitely green, as you can see, and remains mostly in the shade the entire day. 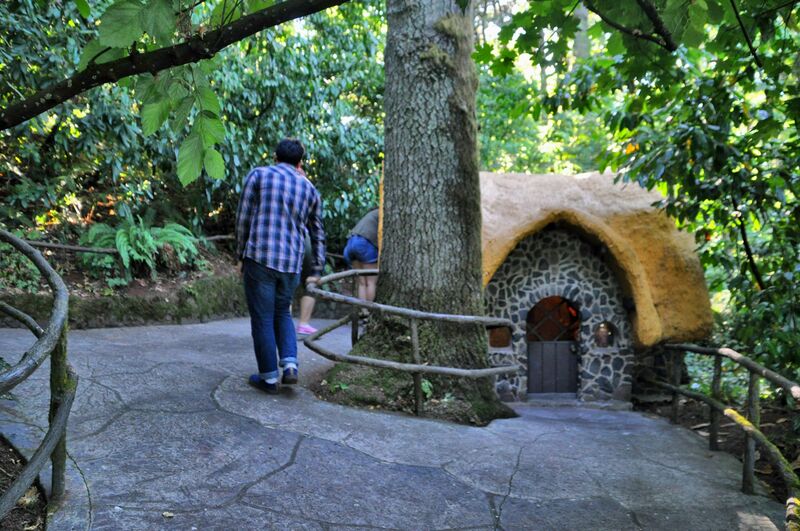 It is built on the side of a hill, and while the whole park is accessible to wheelchairs, anyone walking will certainly feel the steep slopes when going uphill, if you choose to hit those upper portions of the park. There is one small gift shop that is quiet, low-key, and has a miniature train running around the room to keep you entertained if the baubles don’t. There are two small places to order burgers and fries, pizza, and even a decent salad. There are a couple of little carts selling churros and ice cream and water. There is also a tiny ice cream shop. One does not at all get a sense of being pressured to shop. In fact, visitors are encouraged to bring their own food. The kitchens will even store your birthday cakes and ice cream for you in their coolers until you are ready. We took our kids here last year and it was a big hit! I loved it too, very unique. Enjoyed looking at your pictures! Oh I’m glad you had the chance to see it before your family went in search of new adventures on the East Coast. It really is a wonderful place. There is certainly enough there to delight a whole family. And it’s surprisingly large, with so many separate parts. Did you go through the Haunted House? It was seriously scary! Ha Ha ha!! That is a funny thought, isn’t it?! The kids were running around, having so much fun, but saying things like “Look how dumb this is! Let’s go do it!” We were there all day long. It was a super idea for a birthday party for mostly grownups. I think they were all 18 and 19. Heavy on the creepy. Light on the enchantment. I want to go! Fairytale and fable do often have a creepy side and this place definitely provides enchantment with just a teeny bit of fright. For less than $11! I love that you have seen Mr. Tofte! You know, it seems like some of the things there could be downright scary for a small one! Most of it is filled with humor that makes up for it. 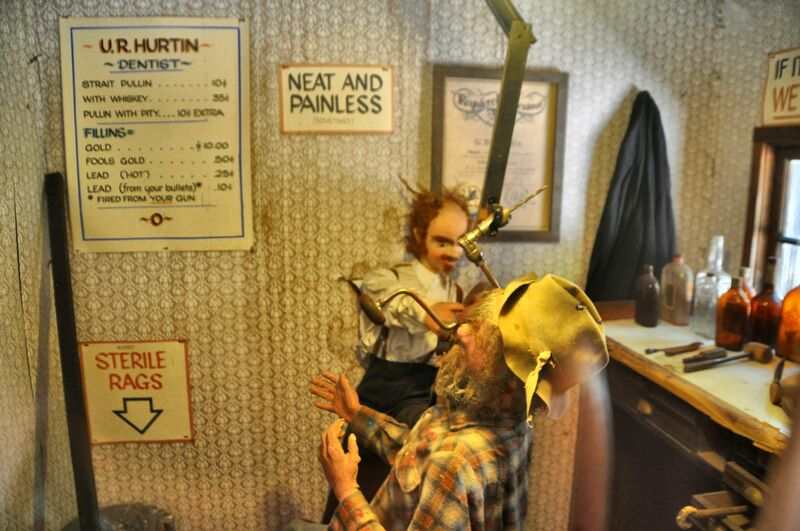 Even inside the haunted house, there are jokes to be found. I think you are just the kind of person who would take the time to peek into every single window, and discover all the surprises. Before we went last year, Tara and I watched a pretty neat video on YouTube about the history of the Enchanted Forest, so we learned what people in the family look like. Then we went there and we recognized them as soon as we saw them. This looks fabulous! I wish I could turn back the clock and take my kids there (although I bet I would have more fun than them). 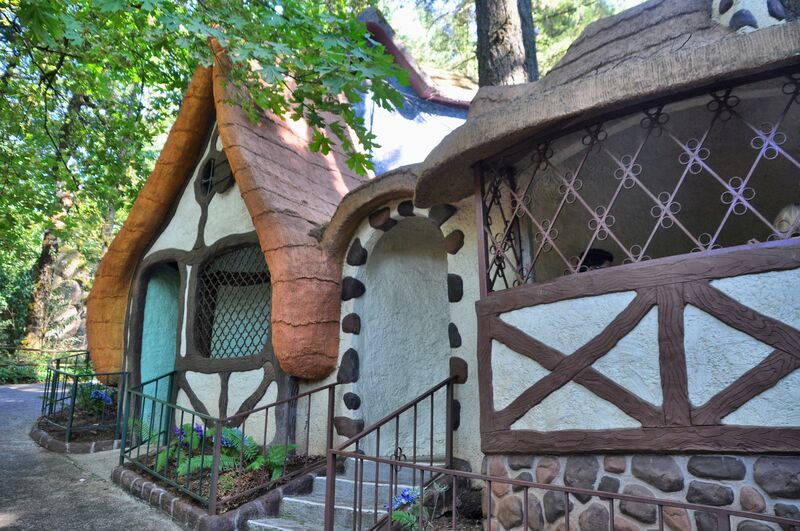 The bunny in the seven dwarves’ house is just too cute. Thanks for sharing. Sorry I haven’t been around for a while – it looks like I’ve got quite a bit of catching up to do. Oh gosh, Sarah, no apologies needed. I am dreadfully behind on reading all my fave blogs right now. Summers do fill my days and leave me less time at the computer… but I suppose that is the way I like it to be. It’s good to hear from you! And yes…I think I am just like you: I might actually enjoy the place more than the kids.